Four and one half weeks till Easter Sunday! How much time have you spent preparing? Have you done any decorating to signal to your family and neighbors that Easter is coming and that this holiday is important to you? Are you preparing for this day as the most important celebration of the entire year? I could ask more questions but this is not a guilt trip. It’s simply to illustrate that most of us begin thinking about Christmas months before December arrives. At four weeks our gift buying and decorating are almost complete and plans are being finalized for inviting loved ones and friends for parties and feasting. I’m not suggesting we make Easter equal in terms of consumerism, but I am suggesting we make it much more than a Sunday morning event. Here are 20 ideas to help you celebrate with great joy. You might want to print this list and mark the ideas you want to try and then mark your calendar with deadlines and to-dos for making it happen. But don’t do them all. Discouragement will result not rejoicing! Rejoice if you accomplish even one! Start thinking about Easter and begin planning today. Don’t wait till Palm Sunday. Lent began this year on March 6. It’s a season intended to help us prepare our hearts to worship Jesus for His work on the cross. You aren’t a failure if you start late. 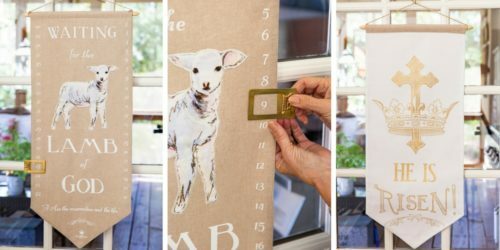 You can still order our Easter Advent Banner and calendar to help you and your family countdown the days to Easter like we do at Christmas. prepare your hearts and minds. The content is a great discipleship tool for parents and kids alike. Create anticipation with a countdown to Easter. Make a traditional numbered a paper chain for your kids to tear off one paper loop each day. Let them each hang one in their room. Plan meaningful decorations for your home. Please forego the chicks and bunnies. Instead, hang the He is Risen Easter Banner on your front door. Set fresh spring flowers on your mantle or kitchen to represent new life. Encourage your kids to build a cross with old pieces of wood and let them decide where to display it. Get your church and community involved with some advance planning. Organize a church or neighborhood egg hunt, using Resurrection Eggs from Family Life. Plan to help your kids reenact the Palm Sunday story. Read aloud the story in John 12. Encourage them to create costumes, and even the scene if you have the space. Invite your friends over for a DIY craft night to make these Easter candles. Use them as décor on your kitchen or dining room table to use during Holy Week. 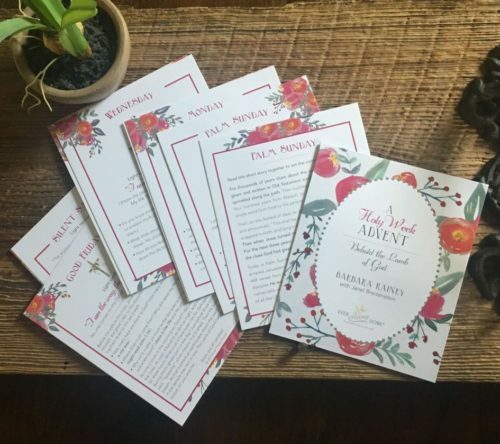 Instructions for how to use them daily are included in our Holy Week Advent cards, a set of 12 devotion cards! Celebrate Passover. This year Jewish Passover is on April 10th. For recipes, a dinner guide, and activities, click here. Tune your heart to worship the sacrifice of Messiah by reading John Piper’s book Fifty Reasons Why Jesus Came to Die. It’s an excellent book for your personal devotion time, conveniently available as a PDF here. Watch The Jesus Film. Dear friends of ours, Tim and Darcy Kimmel, watch the movie on Saturday afternoon and take communion together as a family. Watching the story of Jesus every year will make Easter far more meaningful. Observe Holy Week. Starting on Palm Sunday, read the I AM statements and stories about Jesus from Holy Week Advent cards, (same content as our Behold the Lamb stories), one each day as your family’s devotions. Light your pre-decorated candles with these devotions. Attend your church’s Good Friday services. Talk about Jesus’ death on the cross to make Jesus’ death and resurrection more real to your children. Tear a handmade curtain or a yard length of muslin fabric to explain the ripping of the veil in the temple. Then keep all your curtains and blinds closed to make your house dark. Your family will remember the deep sadness the disciples felt after Jesus died. Dress in black mourning clothes on Saturday’s Easter Eve. Then on Easter Sunday to symbolize Jesus rising from the dead, serve Tomb Cake, or special pancakes to illustrate the empty tomb. Send an Easter care package. If there’s someone you’d love to spend Easter with but distance keeps you apart, drop a meaningful gift in the mail to them. If they’ll be hosting the meal, send the Easter placemats. Or send our Holy Week Advent cards or our Resurrection Day Devotions for someone single or alone to read as personal devotions. Include truth-telling gifts in your children’s Easter baskets. A new shirt to wear to the sunrise service is great, but also add something that will continue teaching your children about what Easter really means. 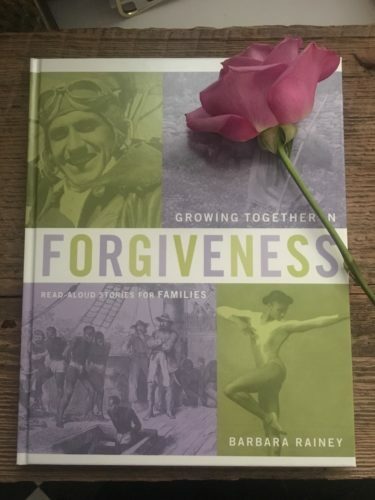 Check out Growing Together in Forgiveness, a read-aloud storybook for families. Wear all white on Resurrection Sunday. Historically Christians have dressed in white at Easter to symbolize we are set free from sin and will one day be wholly pure. Think through what you have in your closet and your kids’ closets that you can dress in white. Or start shopping! Invite others. Around the world monumental events are rarely celebrated alone. Weddings, birthdays, graduations are grand occasions shared with family and friends. Easter should be the same and more! 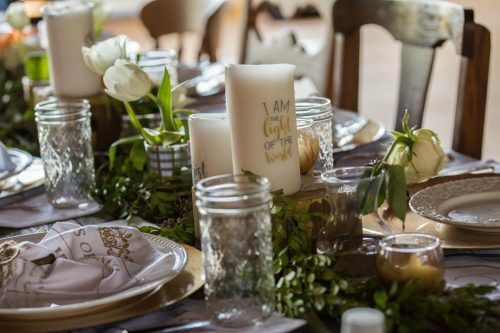 Use our FREE printable Easter invitation to invite extended family, friends, or neighbors to join you or partner with a friend who has more space to plan, prepare, and share a feast to be remembered. Help your church make Easter Sunday memorable. A good friend of mine, Andrea, a pastor’s wife, said Easter at their church is a party. She said they shoot confetti cannons and encourage all the members to bring bells to ring and banners to wave to enhance the celebration. Last Easter everyone was given a cake pop as they left the service. Prepare a special feast. Find a suggested Easter menu or ask friends for ideas. One of our favorites for our Easter meal is Spring Salad. 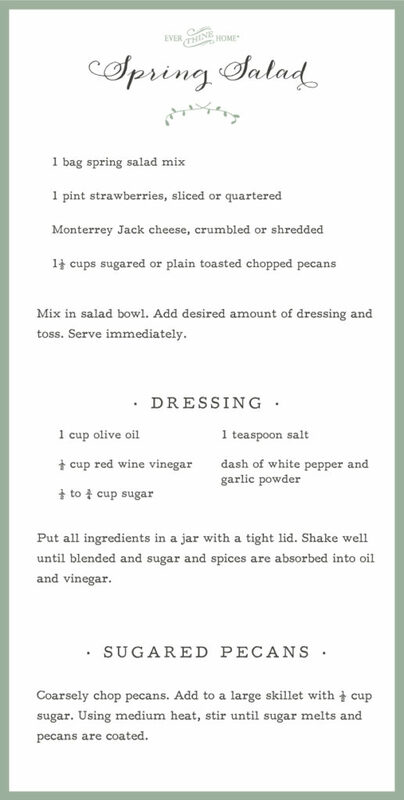 Here’s the recipe if you’d like to add it to your menu. 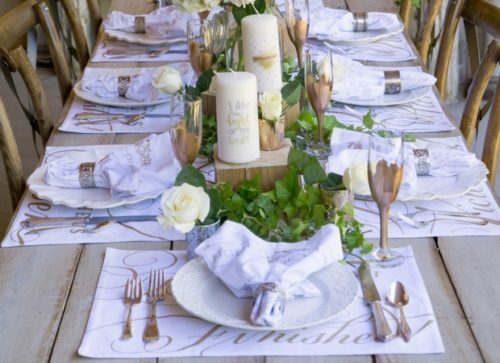 Create a grand tablescape for Easter lunch or early dinner feasting in a gold and white color scheme. Gold reminds us of our victorious King and white represents the purity of His perfect life and the purity that will be ours one day. Your décor doesn’t have to be expensive. Set the DIY candles on blocks of wood to create varying heights. Fill mason jars with white roses, hydrangeas, or even baby’s breath. If the weather is glorious, eat outside with gold-rimmed paper plates, gold plastic silverware, paper cups. We even found gold striped paper straws for our photo shoot. A backyard picnic setup gives the kids space to play when the feasting is over. Recount the story of the Resurrection during your Easter feast. Read the miraculous stories on our Resurrection Day Devotion cards. The short stories are written for 10 years to adult, but younger children can listen quietly to the stunning wonders that God performed the first Easter. Make an Easter playlist of your favorite hymns and songs that focus on the cross and the resurrection. 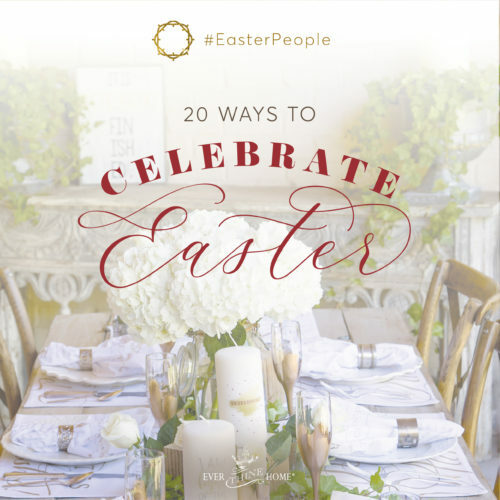 Listen for yourself and your family in the weeks before and after Easter, but on Easter Sunday, play them all day in your home and during your backyard celebration. I want to encourage you to respond to the miracles in words or songs by celebrating with exuberant dancing, clapping, or singing together. Easter is a day to party like no other. The resurrection of Jesus the Messiah is the pinnacle of world history. It is the greatest miracle of all time. Is it any wonder the watching world isn’t impressed with our faith if our celebration is marked by the appropriate somber tone of Lent with only an hour or two of moderate joy on Easter Sunday? I pray you will join us and hopefully thousands of others as we plan celebrations that are worthy of our risen Lord and the envy of all who don’t know Him. Christ’s victory on the cross is the answer for every wound and need in every heart. I am so excited to start celebrating Easter more purposefully this year! Thank you for all the wonderful ideas! I love these ideas! I wanted to share these Lent and Easter playlists (hymns and worship songs) that you can stream for free on YouTube: http://www.celebratingholidays.com/?page_id=11590. My family enjoys singing a hymn every night. I can feel a surge of energy just reading these ideas….so good! Thank you for these ideas and suggestions! I love the hope that Spring offers, and now I’m inspired to include Easter as a bigger celebration! I have been thinking the same thing! That we should prepare our hearts for Easter like we do for Christmas! Yes, Easter should be more than just a Sunday morning event. Thank you for these ideas! thank you for this!!! we get so busy preparing to be busy serving that we fail to worship and prepare our hearts ahead of time! our teenagers just know it as a tiring day that we serve all day and then eat! thank you for reigniting the reason for THIS season! It certainly deserves all the attention and honor we can give! These are such great ideas! I will be be thinking about making these weeks before Easter more special! Thanks for the gentle reminder. Agree, and great ideas. Easter is my favorite holiday and we have already done two crafts with my granddaughters. Celebrating the gift of life! What awesome ideas! Thank you so much! I will be using many of these to re-engage our teens! 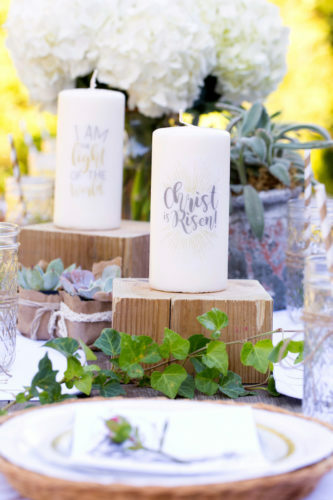 Also a great idea for my friends and I to get together to make the Easter candles for our table setting on Easter!